A few years ago, I was asked to design an interactive children’s garden in a remarkable accessible play space. Owen’s Playground was built to accommodate anyone and everyone who might want to play or even watch kids at play. There are climbing structures, nets, and swings and roundabouts that can be used by anyone, however abled, and there’s also ample path space for wheelchairs and walkers and comfortable seating for parents and grandparents. My own favorite part is Hannah’s Garden, a spiraling garden that twists up a sloping path to the top of a little hill topped with a bench and a beautiful crabapple tree. The beds are full of plants that can be picked and petted, tasted and tucked into braids. While the main paths were laid out by design, others appeared as “lines of desire” that indicate the way real people decide to use the space. The way real people use the garden has also shaped the way the beds are planted and what the garden holds. Initially, we were very careful to choose plants that are not toxic, don’t shed a lot of pollen, and don’t have extremely strong fragrances, since they can cause problems for folks with compromised immune systems, allergies, or potent sensitivities. The trickiest part was picking plants that aren’t especially attractive to bees, since combining kids at play with lots of bees isn’t a good idea. Fortunately, there are plenty of low pollen producers, from female sunflowers to columbines, dusty miller, geraniums, pansies, petunias, phlox, verbenas, and zinnias, all of which we planted in abundance. We let the new paths guide our planting patterns, making sure there was plenty of room both for people to sit and play and plants to spread and clamber. We also interplanted flowers with food that can be eaten out of hand, notably many kinds of strawberries and blueberries and lots of herbs. There are greens galore, especially colorful kales, which many kids love to nibble as they play. The important part is that there’s nothing they can’t touch and no place they can’t go. Yes, some plants definitely suffer from this interactive aspect, but we also see kids being very respectful of the plants, even treating them with tender affection. I knew this free range approach could work because it worked with my own kids and their friends. I think their respect was in part due to the fact that we planted lots of things together, from strawberries in their first “truck garden” (heavy on the trucks) to sunflowers that towered over their play spaces. What they planted, they tended and enjoyed, from pulling up rainbow carrots or picking sweet, tender peas to collecting handfuls of blueberries and raspberries. With this in mind, we created friends for Hannah’s Garden by inviting community members from 4-H and scouts to classrooms and homeschooling families to grow plants and come plant them. We also organized weekly care groups to keep beds weed free and replace plants as needed. Most of these care groups include kids who play in the gardens, which also helps establish a culture of caring and sharing. Among my own kids’ favorite garden experiences was the making of bean teepees, which we did by weaving sturdy cones of bamboo stakes and tall branches collected from the woods after winter storms. Wired together at the tops, these became a framework for the teepee, which was a favorite hideout in summer. We’d surround the cone with runner bean starts, which scrambled up the twiggy branches with alacrity. At Hannah’s Garden, our amazing Parks crew built a charming hobbit house for beans, which we trimmed with sunflower heads to bring in the birds after the beans were done. One thing that did make me a bit nervous about the bean teepee idea is the way bees love bean flowers. On warm days, those bean plants would be abuzz with bees busily harvesting pollen and nectar from the scarlet blossoms. However, the flowers are entirely on the outside of the structure, with the kids tucked snugly inside. In all the years we made these teepees, nobody every got stung, probably because bees are not at all interested in stinging people unless they feel threatened. As well, the lower growing blossoms were pollinated first, and as soon as bean pods started plumping out, they were quickly harvested until all the blossoms and beans were out of reach. Sunflowers are also highly popular with bees, but by growing only the taller varieties, the bees can do their thing well out of range of kid activities. Again, in all my years of combining kids and plants, nobody ever got stung except me (and that was when I picked up a tipped over pot that happened to be full of paper wasps in August. Oops.) I’m also tickled to notice that these days, most kids seem very aware that bees are in trouble and need help. They like the idea of creating bee friendly plantings and even understand that native bees like native blossoms (!). I’m especially excited about introducing kids to the natural world and the foodweb because I think that’s a good way to grow new gardeners. Most passionate gardeners have stories about being welcomed into a garden as a youngster. Many gardeners are good cooks too, thanks in part to the encouragement of an older family member, neighbor or friend. And by now, everyone knows that food-fussy children who help plant and pick edible crops are more likely to eat things they grow themselves. Similarly, children who are allowed to play and explore in a garden setting are likely to become lifelong gardeners themselves. Perhaps the best way to engage children in gardening is to begin not with chores but with pleasurable projects. Small children love to help and they delight in working closely with adults. Find a space where enthusiastic but unskilled garden activities won’t wreak havoc with your main crops and invite the kids in. The result may be the most important seeds you ever plant! If more than one child will be in the garden with you, find a spot for each child to make their own. Toddlers will love a space that combines a sandbox and digging tools with a bit of planting ground. My grandson’s sandbox, which can double as a fire pit with the addition of a large metal fire bowl, is full of dinosaurs and dump trucks, with kale and carrots on the side. A short hose (drinking-quality) with an easy-to-use spray nozzle provides endless pleasure in watering plants, filling buckets, and occasionally soaking an unsuspecting granny. In a tiny garden, give each child a huge tree pot filled with sand (for playing) or soil (for growing). Tiered strawberry and lettuce planters can fit on the smallest deck or terrace, and many edibles can be grown in vertical gardening structures and containers designed to hang over fence railings. 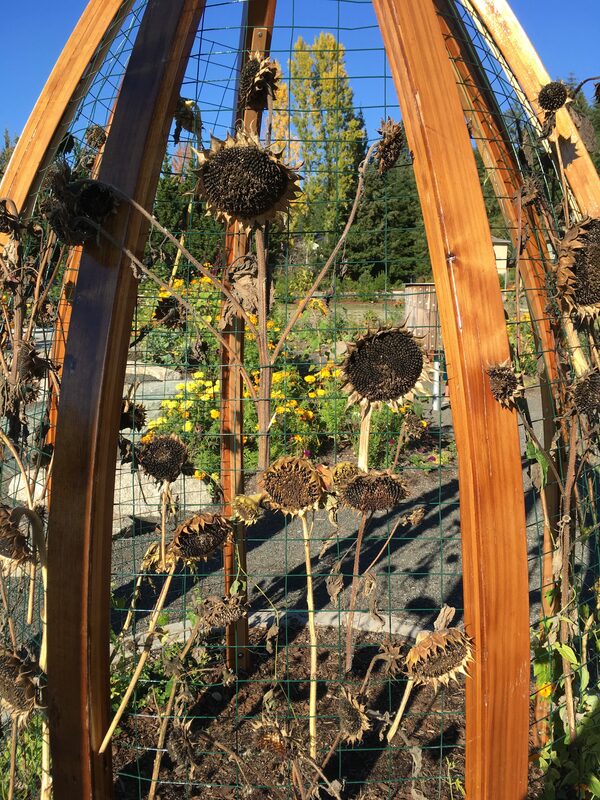 This entry was posted in Annual Color, Gardening With Children, Health & Wellbeing, Sustainable Gardening, Sustainable Living and tagged Bean Teepees, Beans And Bees, Children At Play. Bookmark the permalink.